In December 2017, Councilwoman Cindy Bass introduced a bill that authorized the City to acquire the defunct railroad trestle across Germantown Avenue adjacent to Cresheim Creek. The trestle, purchased from PECO for a dollar, will allow the Cresheim Trail to continue its course across the Avenue and on toward Montgomery County. The acquisition also gives new life to a 15-year-old idea to paint the bridge. In 2003, the Rotary Club of Chestnut Hill, Mt. Airy USA, and Mural Arts Philadelphia hosted a first version of a mural contest. But as the City did not own the trestle, work could not begin, and the project was shelved. In the interim years, Friends of the Cresheim Trail and Philadelphia Parks and Recreation built nearly two miles of natural-surface trail between Allens Lane and Germantown Avenue, with direct connections to the trails in the Wissahickon Valley and with planned connections to the trestle and future phases toward Fort Washington State Park and the Tookany/Tacony/Frankford trail system. 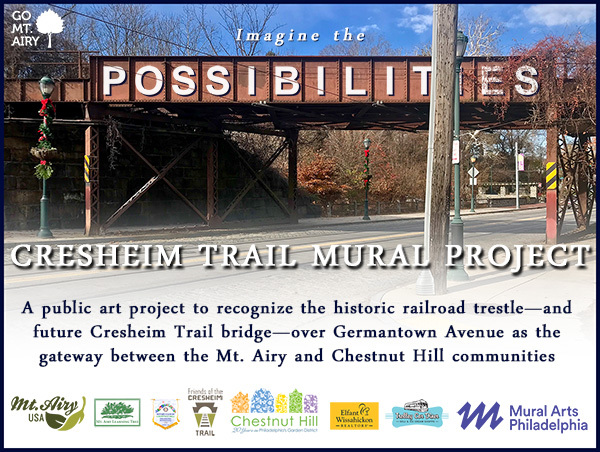 Now that the City owns the trestle, interest in the mural has been renewed, championed by a Cresheim Committee of Mt. Airy USA, Mural Arts Philadelphia, the Rotary Club of Chestnut Hill, Trolley Car Diner, Chestnut Hill Business District, Elfant Wissahickon Realtors, Mt. Airy Learning Tree, and Friends of the Cresheim Trail. All parties, including the original winning artists, agreed that a new contest is most appropriate. Stay tuned here and on Go Mt. Airy’s Facebook and Instagram accounts for additional details.